ACCORDING to Kit Young—an American pianist and composer who has been performing Burmese sandaya music (piano played in Burmese style) since 1987—the Hawaiian slide guitar was probably introduced to Myanmar by Tau Moe, a Hawaiian performer who played a series of concerts in Yangon in 1927. The Burmese made it their own, playing it lap-style and open-tuned rather than slung over the shoulder; eschewing strumming in favour of complex, syncopated picking; using the lower strings as drones or walking bass-lines while the upper mimicked a voice. Burmese music is exceptionally complex—rhythms change suddenly, melodies bounce from instrument to instrument—and can be difficult for Western-trained ears to follow. 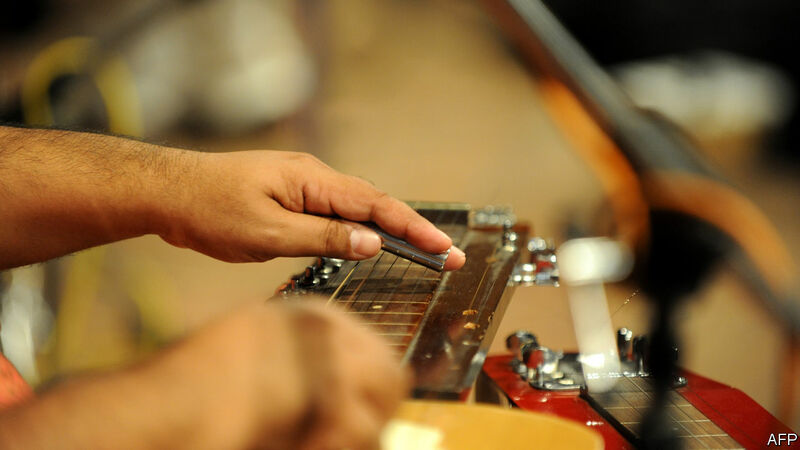 The slide guitar fit in perfectly, taking on a role similar to the Burmese harp. It became popular as background music in films; slide guitarists could make a good living during the mid-century golden age of Burmese filmmaking. But in 1962 the army seized power and Myanmar turned away from the outside world. Musicians had fewer opportunities to work. Some found work with state television and radio. Others—such as Hsaya Tin, who until his death on February 4th at the age of 88 was Myanmar’s greatest living slide guitarist—turned to other professions: Mr Tin made his living as a plumber. Whatever discourtesies Mr Tin suffered (Hsaya was his well-earned title, meaning “teacher”), he did not return them. In person he was reserved, serious and played with the sort of playful, offhanded precision that only comes with mastery. He enjoyed playing the guitar more than talking, which could make him a frustrating interview subject. But the music more than justified the visit.